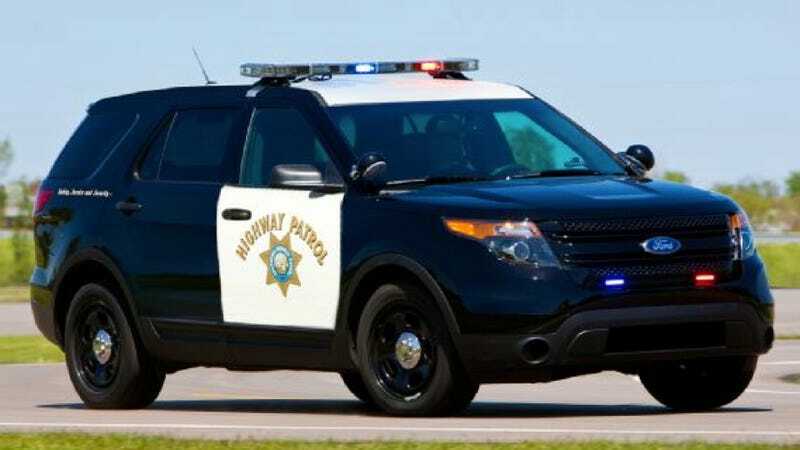 Faced with the eventual phasing out of Ford's legendary Crown Victoria Police Interceptor, the California Highway Patrol is interested in replacing the aging cruisers with an interceptor version of the Ford Explorer. Officials said that newer sedans like the Dodge Charger and Chevrolet Caprice are too small. CHP spends roughly $15 million every year replacing a third of its 4,000 vehicle fleet (that means there will be more than 1,000 Crown Vics up for grabs soon). In addition to offering all wheel drive, the Explorer has a 1,700-pound payload capacity, more in line with CHP's needs than lightweight sedans, Assistant Chief Erik Knudsen told the L.A. Times. It's EPA mileage estimate is 17 mpg in the city and 23 for freeway cruising, compared to 19 city, 31 highway for the Charger. EPA hasn't yet gotten around to crunching numbers on the Caprice, although Car and Driver estimates that it gets 15-17 mpg around town and 24-25 on the freeway. Assuming each trooper has to carry communications equipment (radios, light controllers, laptop, etc. ), medical gear, highway patrol-specific tools and whatever other stuff they have to schlep around, it's no wonder that CHP officers need big cars. Then again, Department of Homeland Security grant-funded (and now mandated) gear has added significantly to that load over the past decade. Do they really need all that stuff in every cruiser? Would it be possible to have a few light response vehicles for urban areas? This might sound like a crazy idea, but maybe it would be better to adopt a more focused approach to police fleet dispersal. What I mean by that is that instead of packing every patrol car with DHS supplied anti-terrorism gear, why not pick a few for that duty in specific zones, making it possible for the rest of the fleet to be comprised of lighter, more fuel efficient cars. Considering California's tense economic climate, that option might make more sense, although implementing such a plan could prove too cumbersome for an already ponderous state government. But CHP's interest in SUVs has a benefit for those of us in the civilian fleet: Ford Explorers are taller than any of the other cop car candidates, so they'll be easier to pick out of the lineup on the freeway.